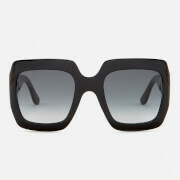 Women’s oversized square sunglasses from Gucci. 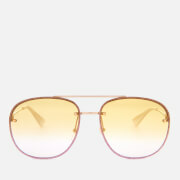 Inset with graduated brown lenses that provide 100% UVA/UVB protection, the square-shaped glasses feature a glittery gold acetate frame and metal rim. Featuring a gold-tone metal bridge and thin metal temples with tortoiseshell acetate tips adorned with gold-tone bee embellishments to the curved ear pieces. 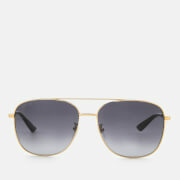 Presented in a velvet hard case, the sunglasses are complete with branding engraved to the temples and etched to the top corner of the left lens. Eye Width: 62mm. Bridge Width: 10mm. Temple Length: 142mm.